The dream-busters are led by Chief Justice John Roberts. In 2009, he wrote, “The historic accomplishments of the Voting Rights Act are undeniable.” But ”“ and Roberts’ “but” is huge ”“ the Act is out of date and “fails to account for current political conditions”. According to Roberts, “Jim Crow laws” ”“ the apartheid rules used in the Deep South to keep African-Americans from the polls ”“ have long passed away. So, Roberts is ready to dump the key enforcement provision of the Voting Rights Act ”“ the “pre-clearance” requirement. Sixteen states must “clear” any changes in voting procedures with the US Department of Justice. That’s to make sure there’s no racial monkey business ”“ that new rules aren’t clever tactics meant to remove black, brown, Native American, Catholic, Mormon or other minority voters. Why pick on Dixie? After all, despite the hours-long lines of Black voters in Florida we saw with our own eyes, Pew shows that there’s only a 23 minute wait to vote in Florida ”“ less time than it takes to cast a vote in Indiana. Overall, Florida ranks near the best in Pew’s “Elections Performance Index”. Let’s give a medal to Florida’s former Secretary of State, Katherine Harris! In other words, why single out Florida and the 15 others? And Oddly, despite a hot, hot Presidential contest with an African-American candidate, by mid-May 2012, the Census Bureau reported that the number of African-Americans registered declined by over one million. Hispanic names on voter rolls fell, too, despite massive registration drives. A big decline in voters of colour was reported in the South’s huge swing state, Florida. In 2012, Florida’s new Republican Secretary of State Ken Detzner again set out to bleach the voter rolls whiter than white. Using lists of illegal aliens, the GOP hack marked 182,000 (!) voters whose names matched the deportees. So how many illegal foreign voters were arrested in Florida? One: an Austrian-Canadian gun aficionado. Yet, nearly one in ten Hispanic voters would have been barred from the polling booth. But, at the last moment, federal voting rights law stopped the Republican’s latest JosÃ© Crow manoeuver. But wait ”“ if the Voting Rights Act required Florida to get federal approval for voter roll purges, how could Steen and other black men have been stripped of their rights? As a result of their changes, states designated officially racist include the Confederate states of”¦ California, Arizona, New York, New Mexico, South Dakota and Alaska. Alaska? You betcha! And for good reason. Take California ”“ under a Republican Secretary of State, Bruce McPherson, 42 percent of voter registration forms were rejected, an overwhelmingly amount of those Hispanic, Arab-American and Asian. Jim Crow, it seems, became a surfer dude. That’s because Jim Crow is now Dr James Crow, database analyst, a hired gun who knows it’s easier to win elections by blocking voters rather than winning their votes. Identifying and challenging “suspect” voters is far more effective in chasing away black than burning crosses. 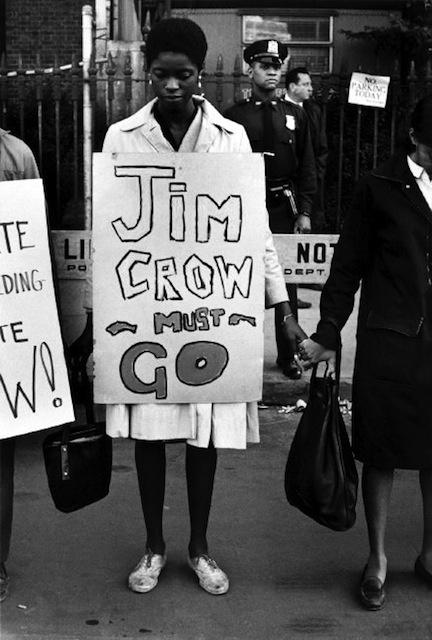 The solution is not for the Supreme Court to let Jim Crow ride again through the Southland, but another expansion of pre-clearance scrutiny to Ohio, Indiana and those states that need a little Reconstruction.